Chrissy Teigen Cringes During Stacey Dash’s Awkward Oscars 2016 Stint: GIF! And she&apos;s owning it! Chrissy Teigen had yet another amusing audience reaction while attending the 88th Academy Awards on Sunday, February 28 — and it was all caught on camera. The pregnant model appeared uncomfortable when Stacey Dash made a surprise appearance on stage. Chrissy Teigen reacting at Oscars 2016. As previously reported, Dash, 49, was met with crickets when Oscar host Chris Rock introduced her to the packed audience at L.A.&apos;s Dolby Theatre. "I cannot wait to help my people out," the Clueless alum said. "Happy Black History Month!" The joke was an apparent reference to her comments from last month, when she said that she wanted to eliminate Black History Month and the BET Awards. She made the controversial comments while addressing the lack of diversity among this year&apos;s Oscar nominees. Despite the drama, the Fox News commentator was upbeat on Sunday night. Teigen, however, seemed mortified by the entire bit. Screenshots of her face were initially misinterpreted as a reaction to Sarah Silverman&apos;s appearance, but she clarified the awkward moment via Twitter. "I was making the face from the Stacey Dash moment ahhhhhhh not Sarah!" Teigen, 30, wrote to her more than 1 million followers. "no I am not good at poker." 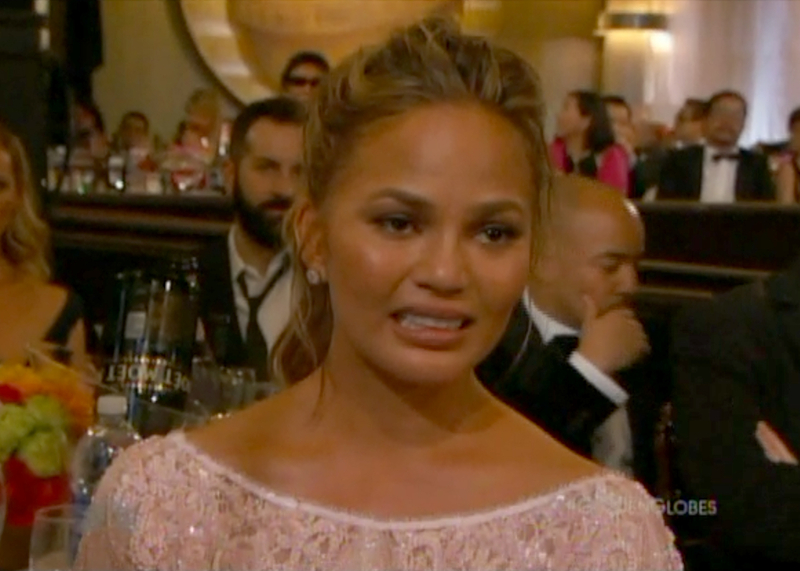 Chrissy Teigen reacting at Golden Globes 2015. Teigen is used to wearing her emotions on her sleeve. Last year, a photo of her crying at the Golden Globes became a viral meme. She teared up when her husband, John Legend, and Common won in the Best Original Song category for Selma&apos;s emotional anthem "Glory."